Is it possible to have an empty Home Screen page? I recall having to delete empty home screen pages. Now, when the last icon is removed on a home screen page it goes away. I'd like to have buffer pages with no icons on them, between home screens I use. Can you not use something like Zooper to create a blank widget. That would keep the home page there, but there would be nothing on it. Thanks! The idea of a transparent icon that had no function had crossed my mind, but I had no idea how one might go about creating one. Zooper did it effortlessly. Good thinking. I'll have to remember that. 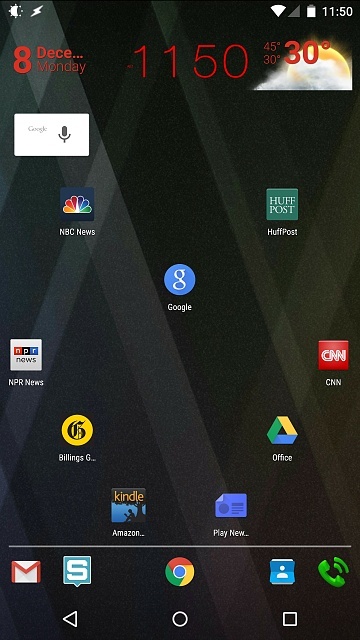 If you're not married to the Google Now launcher, you can also do it with many third party launchers like Nova. Zooper empty icon worked great. Wanted to keep the stock launcher because I understand the new Tap N Go new phone set up can pull your screen set ups (icon configuration, home screens, folders, etc.) from a source phone, and I am hoping the standard Android back up via Google does the same thing. It was not clear to me if using other launchers would provide this feature. Once you use a 3rd party launcher you will likely never go back. They increase your customization options by an order of magnitude. Grid layout, icon size, number of screens (empty or not), all sorts of things. With Apex, I can backup my home settings and restore or migrate them as needed. I'm sure all the big ones (Nova, Go, etc), have the same functionality. It's easy, too. In Settings, you backup both your Apex settings and desktop settings. This file gets stored in Android>data>Apex launcher. Save the Apex folder to somewhere like Gdrive, so if you do a reset you've still have it. When you rebuild your device, backup again so that you generate the Apex folder, and then replace it with the saved folder. Best way to report Xperia Z3v bugs and/or feature requests? Why do I have a slow charge after updating to Lollipop on Nexus 7?